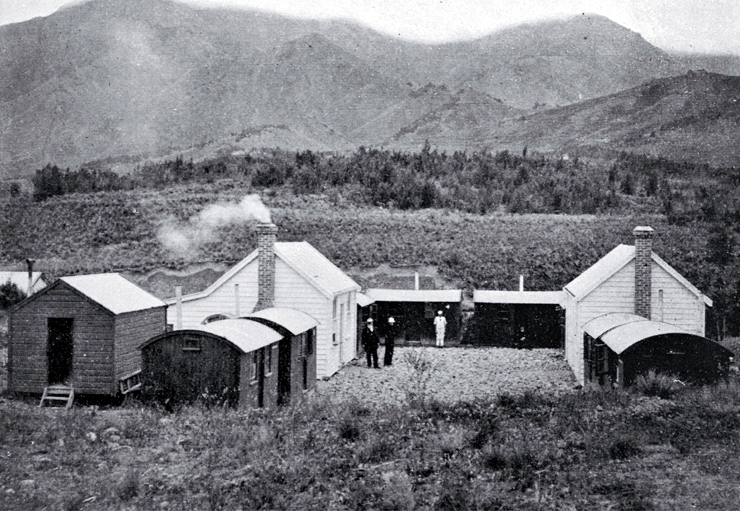 The prison camp, Hanmer Springs (1904). File Reference CCL PhotoCD 9, IMG0004. Between 1900 and 1901 reserve land was set aside in Hanmer Springs for planting exotic trees to supply the Christchurch market. Planting of radiata pine and Douglas fir began in 1902-1903 and prison labour was used 1903-1913. There were 25 prisoners here in 1904, most of whom had asked to serve their sentence at Hanmer. Conditions were the same as a city prison, the only difference being the men got an additional four marks a week remission for industry. See The Press, 10 September 1904, p. 3; The Weekly Press, 24 March 1909, p. 67. Do you have any photographs of Hanmer? If so, feel free to contribute to our collection.